Leptospermum ‘Rudolph’ is a hybrid developed by Bywong Nursery in southern NSW. Its parents are L. spectabile and a burgundy leafed form of L. morrisonii. Leptospermum ‘Rudolph’ is a medium, upright shrub with purplish foliage and large bright red flowers. Both parents have provided this hybrid with flower and foliage colour. 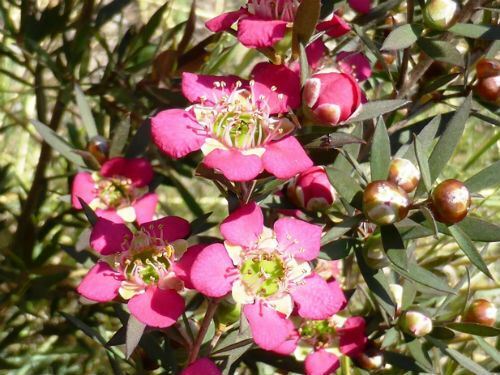 Leptospermum spectabile is a rare tea tree from the Colo River north of Sydney. This is a spectacular species with large red flowers. Unfortunately, L. spectabile does not like our cold climate garden. We have tried to grow the species a few times with no success. All is not lost because Leptospermum ‘Rudolph’ survives and thrives in our garden. Its flowers are similar in size and colour to L. spectabile and cover the plants in summer. The burgundy foliage, inherited from L. morrisonii, is a bonus. Some of our specimens are over five years old. Propagate from cuttings to preserve the desirable characteristics of Leptospermum 'Rudolph'. Leptospermum ‘Aphrodite’ is another variety from Bywong Nursery. One of its parents is also L. spectabile. See L. Aphrodite article.